What products does this Tool Storage study cover? 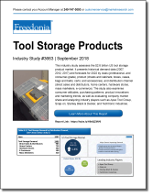 What are the key trends to know for tool storage products? Although growth rates will not vary much among product categories over the forecast period, chests and cabinets will grow at the fastest rate, followed by carts. Chests, cabinets, and carts represent the highest-priced products in toolstorage and are used extensively by professionals, who tend to be less price-sensitive than consumers, supporting dollar sales growth in the future. Tool storage sales are somewhat seasonal, particularly for consumer products. Peak sales occur in the last six to eight weeks of the calendar year – between Black Friday and Christmas. Father’s Day is the next most common instigator of tool storage sales. Tariffs imposed on steel and aluminum imported to the US from the EU, Canada, and Mexico are expected to contribute to price increases of tool storage products made from those materials, at least in the near term, as companies consider adjusting supply chains. The duties imposed on Chinese and Vietnamese consumer metal chest and cabinet suppliers only affect a relatively small slice of the tool storage market. US manufacturers of such products, particularly Waterloo Industries, should benefit from the government’s antidumping actions. Who Buys Power & Hand Tools?